GradeCam™ is an assessment grader that allows teachers to use a computer with a camera or almost any USB document camera to score assessments using GradeCam answer sheets. Once the answer sheets are scanned under the camera, the GradeCam/SchoolCity integration posts assessment scores directly into the system. This document will review how to install the GradeCam Plugin. 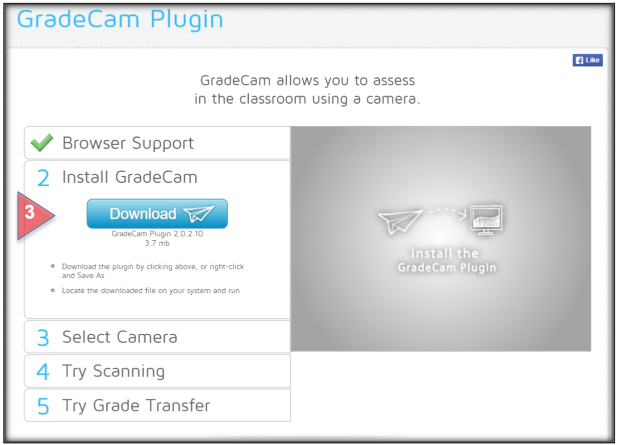 Note: GradeCam™ is only available for use with the SchoolCtiy Suite if your district has licensed it through SchoolCity. From the Top Menu Bar, select Assessments (1a). Find the desired assessment from the list in the Assessment Manager. Select the bolded GradeCam icon (camera) (1b). This will take you to the GradeCam scoring page, where you can install the plugin. Or, From the SchoolCity Suite Launchpad, select the SCORE Flip Card. On the flipped side, select Scan using document camera. Find the assessment you wish to score, or click on More… to go to the Assessment Manager (1c). 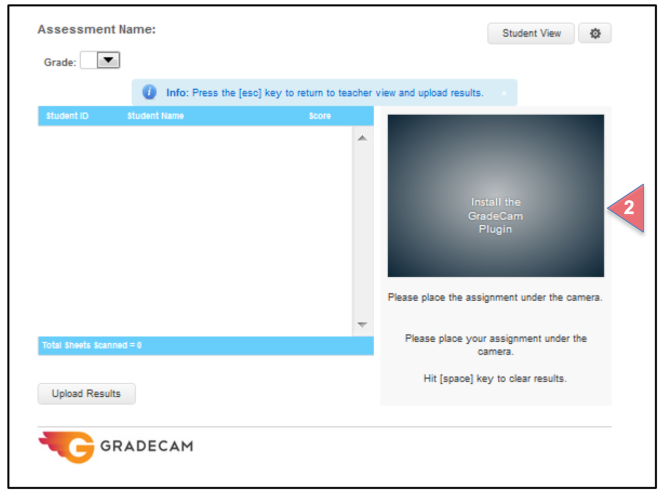 In the GradeCam scanning screen, click on the scoring window to install the GradeCam Plugin. Follow the steps as outlined by GradeCam to complete the installation. Once it is complete, you are ready to score your GradeCam answer sheets. Please see the Help Document, Score Assessments: Score Using GradeCam for more information.